Academic Freedom and Democracy – ALEC Style	 Is Global Warming a Religion? On the surface, ALEC is the American Legislative Exchange Council, an organization that provides model legislation for our state and national legislatures. The membership of ALEC is composed of 300 corporations, a number of special interest groups, and many politicians including about 2000 state legislators, governors, US Congressmen, and US Senators. ALEC sponsors meetings where the corporations and their lobbyists entertain the legislators and help craft what they call “model legislation”. From the corporation’s viewpoint, it is “dream legislation” – and ALEC is the organization that helps their dreams come true. What corporation wouldn’t want legislation designed to limit their liability, give them subsidies, shield them from regulation, criminalize whistleblowing, lower their taxes, provide them an edge over competing technologies, or to transfer public funds to them by privatizing health care, workers comp, public pensions, and prison systems? The press, average citizens, small business owners are excluded from ALEC’s membership and their meetings. There are steep fees to join, except for legislators, and ther are requirements to insure that members are in harmony with ALEC’s mission. They try to keep keep their membership, agendas, and minutes of their meetings from public scrutiny and most information about them is gained from leaks. An elaborate system has been set up to see that information cannot be obtained from legislators by Freedom of Information Act requests. Often, legislators meet with CEOs and corporate representatives, while citizens gather across the street to protest corporate greed. Much of ALEC’s secret activities are coordinated through Americans for Prosperity, a Libertarian think tank that now has offices in all 50 states. Over the years, about 1000 model bills have been written, primarily by corporate lawyers with some input from legislators. State legislators copy these bills, change them to disguise their source, and present them as their own. It is like plagiarism with the author’s permission or copying someone elses homework rather than doing the necessary research. The legislation does not arise out of the needs of the state or the nation, but from the need of the corporations to increase their profits. The members of ALEC take great pains to keep the process secret and a number of corporations have withdrawn from ALEC over bad publicity when their participation was discovered. With so many lawmakers involved, it is hard to keep secrets, particularly when many legislators are proud of their corporate relationships. And then, Murphy’s Law sometimes exposes ALEC’s hidden hand. A Florida lawmaker, Rachel Bergen, introduced a resolution to lower corporate tax rates, but was rather embarrassed when she forgot to remove the mission statement of ALEC. Oops, the wording was hastily corrected, but the mistake alerted the press to the source of the proposal. Thom Hartmann took note of this error and proposed that all legislation that came from ALEC should have a similar disclosure. 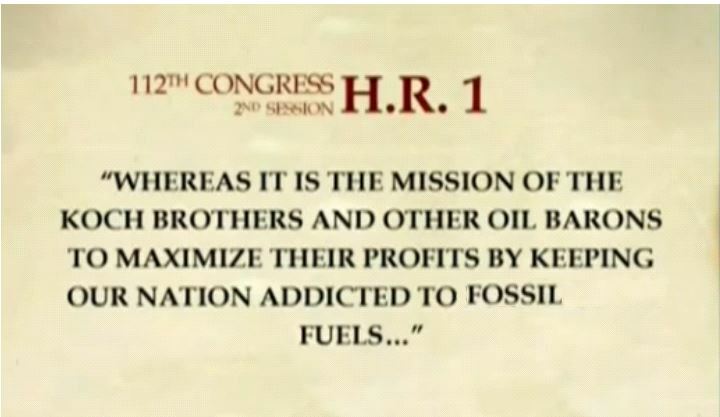 How would it look if a House Bill to approve the Keystone XL pipeline came with this disclosure? 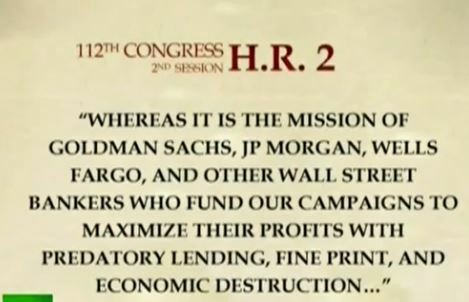 Would a law to gut Wall Street regulation and the Consumer Protection Act pass if it came with this disclosure? Congress has voted 37 times, at last count, to repeal the Affordable Care Act. 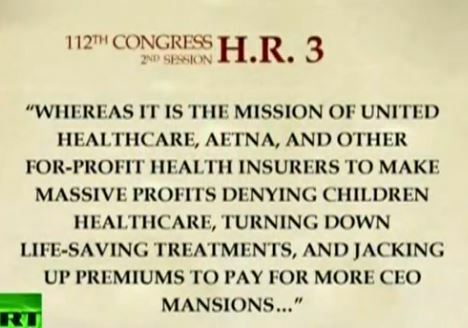 Would that motion carry again if the bill had this disclaimer? Probably. Many politicians have more loyalty to those who fund their campaigns than to the citizens. Supporting ALEC legislation carries an understanding that by sponsoring their bills, politicians will receive support for their reelection campaigns. ALEC’s legislation is supported with biased but academic sounding research, talking points, and slick ads to convince voters that the politicians are really looking after their best interests. Most voters, the press, and even legislative colleagues often do not realize that the legislation came from ALEC. Clealy, transparency and full and honest disclosure is need. However, ALEC has 401(C)3 status as a charity, which makes it tax exempt and hides its motives and the identity of its donors. Although ALEC claims it is not a lobbying group, it is directly lobbying our state and national legislatures while getting around laws that limit lobbying and require disclosures of lobbying activities. One of the most shameful of ALEC’ s activities are attempts to suppress the votes of those not likely to support their agenda. Paul Weyrich, the founder of ALEC was once captured on tape, as shown at 3:49 in this video, explaining that he didn’t want everyone to vote, saying “our leverage in the elections goes up, quite candidly, as a number of voters go down.” That was a long time ago, but Alec is still supporting voter suppression laws that make it more difficult for the poor, the elderly, minorities, college students, and working people to vote. Though mainly supporting corporate interests, ALEC legislation often gives a nod to religious groups and to conservatives to win their support. One of its favorite tactics is to accuse detractors of being leftists or liberals to discredit them with conservatives and Christians. However, the network of think tanks and donors that support Alec are not Conservatives, but they are Libertarians . It is also hard to see how an organization that has such little regard for the poor or for the truth can be considered Christian. Citizens United may have given corporations a large voice with their money, but it could not give them heart or a soul. Besides hiding their funding sources, their agenda, and the identity of those supporting them, ALEC, according to Bill Moyer , is undermining the principles upon which the United States was founded. The strength of the United States is through its unity. However, Libertarians have been working very hard lately, through ALEC , their think tanks, and the far right wing of the Republican Party, to destroy that unity so they can escape regulation and avoid taxes. We live in a country that has enough resources that we could make sure that every citizen has food, shelter, medical care, education, and an opportunity to contribute back to the society. But that won’t happen as long as Congress follows the wishes of those who are willing to let other citizens go without so they can have more. The best situation would be to have a balance in power between business, labor and government. The modern-day Libertarians want to give all the power to the businesses. Their overarching philosophy is that businesses who make decisions in their self interest will lead to the most good for everyone, but the reality seems to be that it makes the most good for the wealthy. This entry was posted on Monday, July 15th, 2013 at 5:12 pm	and is filed under National Politics. You can follow any responses to this entry through the RSS 2.0 feed. You can leave a response, or trackback from your own site.